Jane Goodall is coming to Centre in the Square in April. See the documentary first! 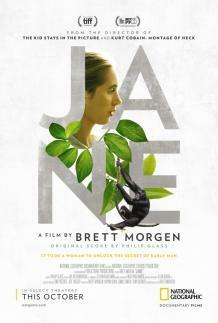 “Three love stories unfold in Jane, Brett Morgen’s stirring portrait of conservationist Jane Goodall. The first is the director’s respect and affection for his octogenarian subject. Embraced in the clear, honeyed light of Ellen Kuras’ cinematography, Goodall comes across as vibrantly plainspoken during a new interview. “There’s also the love between Goodall and wildlife filmmaker Hugo van Lawick, who would become her husband. His dazzling half-century-old footage of her groundbreaking observations of chimpanzees in Tanzania, discovered in the National Geographic archives in 2014 and never before viewed publicly, is the astonishing heart of Jane.